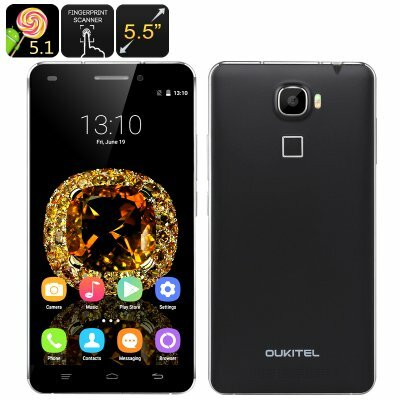 Successfully Added OUKITEL U8 Universe Tap Smartphone - 4G, 5.5 Inch 720p IPS Screen, MT6735 Quad Core 1.3 GHz CPU, 2GB RAM, Android 5.1 (Black) to your Shopping Cart. It's never easy to find a phone with an impressive range of specs, sleek good looks and a reasonable price tag. Oukitel has decided to tackle the problem head on with the release of Oukitel U8 Universe Tap, a smartphone that features a 5.5 inch 1280x720 IPS screen, 4G connectivity, Fingerprint Sensor and Android 5.1. The U8 Universe Tap is a new phone with the latest features, and it is also reflected in the phone’s design. The body is large enough to hold a 5.5 Inch screen, but the smartphone remains light and the bezels are thin to give the maximum space to the beautiful 1280x720 IPS Screen. Thanks to the use of IPS technology, you will benefit from a clear view of your display from any angle, enjoy brighter colours and an overall better image quality. This 5.5 inch smartphone features a Press Fingerprint ID, significantly raising the security level of your device and protecting all your personal data from prying eyes while letting you unlock the device easily with a single tap. On the convenience level, the U8 Universe Tap comes with Smart Wake and Smart Gesture functions, allowing for seamless communication with the device, even through the locked screen. With the support of two SIM cards and 4G connectivity, the U8 Universe Tap stays true to its primary role of a communication device. The phone covers a wide range of bandwidths so that you can stay connected in any corner of the world: 2G: GSM 850/900/1800/1900MHz, 3G: WCDMA 850/2100 MHz, 4G: Bands 1/3/7/20. When it comes to the alternative uses for phones then the U8 Tap Universe won’t disappoint. Featuring a 13MP rear facing camera and a 5MP front camera lets it will handle any photographic task (from a landscape shot to a quick selfie) with confidence and ease. To top things off, with the Oukitel U8 Universe Tap, you will have the pleasure of using the latest Android OS to date - Android 5.1. The new Lollipop version comes with a number user experience improving tweaks, like screen pinning improvements, volume setting changes, new animations and quite a lot more. Visit the Play Store and check out what’s new in Games and Apps - with the latest Android OS, nothing will be beyond your limits. Doesn't work with the VIRGIN network in Canada. This is not the phones fault however. It has something to do with VIRGIN. VIRGIN runs off the BELL network in Canada and BELL works fine on the phone. I actually use ROGERS myself but initially this was going to be my wife's phone but since she is on VIRGIN, it would not connect. Tried different settings, VIRGIN staff tried a few and their Tech centre said there was nothing they can do to fix it...it just doesn't work on VIRGIN network. Again nothing to do with the phone itself but good note for people who are considering it for use with VIRGIN in Canada....try a different phone.